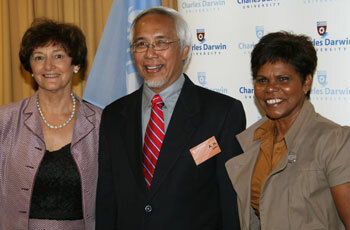 Charles Darwin University will advance its role as a key location for working with Indigenous people and enhancing the broader understanding of and training in Indigenous Knowledge as a result of the launch on Wednesday, 12 December of a United Nations University (UNU) Institute of Advanced Studies (IAS) Centre of Traditional Knowledge. The Centre, which has been supported and warmly welcomed by the Northern Territory Government, will be launched by the Director of the UNU-IAS, Professor A.H. Zakri. The schedule of the centre’s activities for 2008 is being finalised with a major Darwin-based workshop planned for March. This workshop, titled ‘Carbon markets and their impact on Indigenous people’, is an early activity to promote the exchange of ideas and the planning of subsequent research and training. Co-sponsors of the March 2008 workshop include the North Australian Indigenous Land and Sea Management Alliance (NAILSMA), the Australian Greenhouse Office and the United Nations Permanent Forum on Indigenous Issues. The Deputy Chief Minister said the Government was pleased to have committed $2.5 million to the Centre to further develop the Northern Territory’s knowledge-based industries. “The new Centre will tap into the unique knowledge of Indigenous Territorians in fields such as science and the environment for use in modern and emerging industries, helping develop new economic and job opportunities in remote and rural areas,” Ms Scrymgour said. The UNU advised in July 2006 that it had chosen CDU to host the Centre of Traditional Knowledge and planning has been underway since that time. The move by the UNU recognised CDU’s capacity to play a central role in the international debate on Traditional Knowledge. In August 2007 the Northern Territory Government announced its commitment to the establishment of a UNU Centre of Traditional Knowledge at CDU with an investment of $2.5 million over five years. Other philanthropic funding has also been achieved. During 2007 the UNU-IAS has spent almost $1 million on a number of pilot programs designed to demonstrate the types of activities that could be undertaken through the centre which will now be developed at CDU. These pilot activities include the role of traditional knowledge in fields such as climate change, water, international policy making, biological resources and marine management. CDU Vice-Chancellor, Professor Helen Garnett said the UNU-IAS Centre of Traditional Knowledge with CDU as host provided a range of opportunities to promote the recognition of the value of Traditional Knowledge systems in Australia.